Australian company Spark Exploration could be sitting on oil reserves north of 1 billion barrels in the Rona Ridge area in West of Shetland waters. The biggest of its prospects, Bader, is right next door to Hurricane Energy’s huge, perhaps ultimately multi-billion barrels Lancaster-Halifax oilfield complex where long-term early production from the Lancaster part is scheduled to start within three or four months. Spark directors James Jordan and Dr Mark Pay told delegates at the recent annual PESGB (Petroleum Exploration Society of Great Britain) Prospect Fair in London that “mean prospective resources” range 676 million to 1.28 billion barrels of oil depending on whether the prospect is geologically separated from Halifax or not. The acreage where Bader and other prospects have been identified lie within two licences secured seven months ago in the 30th UK Offshore Oil & Gas Licensing Round. It means that Spark’s acreage is bracketed by the BP-operated Clair field and Lancaster-Halifax basement discovery. Bader features the same fractured granites geology as the Hurricane discoveries. 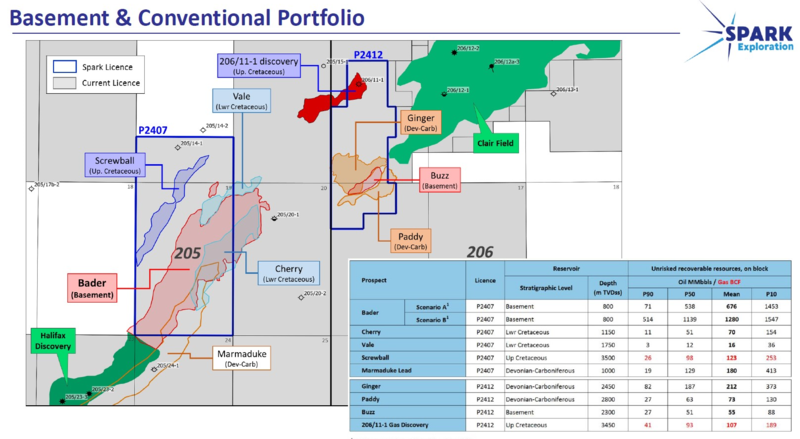 Two other named Spark targets now in oil & gas industry public domain are Buzz and Ginger, both of which neighbour the Clair field where a third phase of development is currently being planned by BP. Ginger is described as a Clair group structural/stratigraphic trap “along strike” of the Clair field itself. Buzz is a basement prospect located on a culmination of the Rona Ridge and up-dip of the culmination of the Rona Ridge and of the mapped Clair field “spill point”, in other words the top of the reservoir. Under the terms of its licence, Spark’s focus is to reprocess and reinterpret existing 3D seismic data. Its fully-funded task started late October with a view to making drill or drop decisions before September 2020. The company is also inviting partners to join in the hunt. 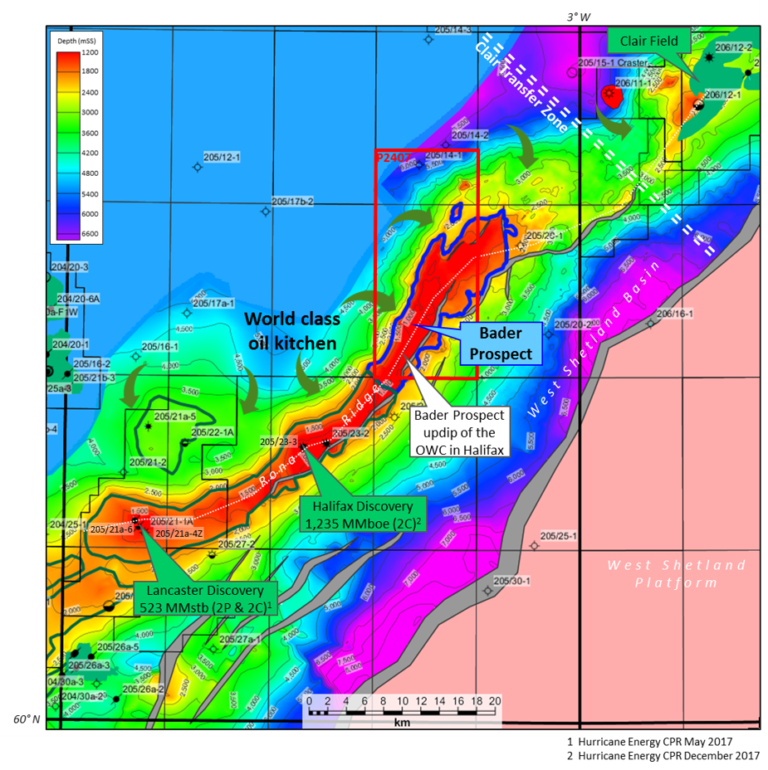 In November 2016, Hurricane’s CEO, Dr Robert Trice, told Energy Voice that he would be surprised if the basement geology so far drilled very successfully by the company did not extend all the way to Clair, either continuously or in bits. Excitement regarding the prospectivity of basement plays in the North Sea is now building, both in UK and Norwegian waters. According to City analysts Hannam & Partners, BP is reportedly planning to drill a basement appraisal well on Clair during Q1 next year. The very first well in Clair penetrated some 200m of oil-bearing basement and horizontal appraisal wells have flowed at over 2,000 barrels per day. Also in Q1, Lundin is expected to spud its first well on the Norwegian sector Goddo prospect. The company is already producing from basement at the Edvard Grieg and Tellus fields successfully.